BALTIMORE (December 16, 2014) – Planit has been selected as agency of record for The AMES Companies, Inc., a leading American manufacturer and global provider of landscaping products. Established in 1774, the AMES® brand is the third oldest brand in the country, and the company is looking to Planit to bring its rich history to life. As its agency of record, Planit will develop an integrated marketing campaign to build awareness for The AMES Companies’ core brands — AMES, True Temper and Razor-Back, and Jackson — by activating their new brand visual language to retail partners, promoting new product launches, and strengthening relationships with end-user customers. Key initiatives will include public relations and social media support, TV and digital media and video development. The AMES Companies offers lawn and garden tools for homeowners, jobsite tools for professionals and outdoor lifestyle products under the brand names AMES®, True Temper®, Razor-Back® Professional, Jackson® Professional, Southern Patio®, UnionTools®, Dynamic Design®, Garant®, Westmix™, Kelso™ , Cyclone®, Nylex®, and Northcote™. Product offerings are available at retailers around the world. The AMES Companies joins Planit’s roster of global clients in the home and building categories including brands such as DEWALT and Royal Building Products. The AMES Companies, a wholly owned subsidiary of Griffon Corporation (NYSE: GFF), is the leading manufacturer of lawn and garden tools in the U.S. Headquartered in Camp Hill, Pa. (near Harrisburg), the company manufactures and markets a wide variety of long-handled tools, wheelbarrows, carts, hose reels, hoses, snow tools, cutting tools, hand tools, pruning tools and striking tools as well as outdoor lifestyle product categories such as planters and outdoor accessories. To learn more, visit ww.ames.com. BALTIMORE (December 8, 2014)– Today Planit announced the addition of two new clients experiencing massive growth in the mobile technology industry. Planit is proud to collaborate with Smartlink, a staffing and services company working with Fortune 100 communications companies, and Omnilert, an award-winning company most notably known for the invention of the world’s first mobile-based campus emergency notification system. Smartlink has tasked Planit with creating contagious creative, messaging and communication that will speak to existing customers while also resonating with critical new audiences to utilize their services. In addition to positioning Omnilert as a renowned and trusted brand keeping people safe and connected in today’s digital world, Planit will springboard off of the over 20,000 organizations, campuses, and companies like the American Red Cross already utilizing Omnilert to connect with and influence key decision makers nationwide. Baltimore (November 17, 2014) — Planit today was named one of the Best Places to Work in Advertising & Media by Advertising Age. The Baltimore agency is among 40 companies selected based on criteria such as hiring practices, benefits packages, salaries, office perks, workplace environment and design. Nearly 20,000 people were surveyed as part of the selection process. This national recognition comes on the heels of Planit’s 20th anniversary. Today the agency employs more than 80 “Planiteers” who act as creative change agents for clients that include mature veterans of the Fortune 500. Planit hosts company-wide outings annually and corporate giving events twice a year where the firm’s creative services positively impact the Baltimore community. Corporate wellness teams plan programs each month, including a Fitbit challenge where employees were rewarded with cash prizes for walking the most steps in a month. Engaging on social media is something employees take upon themselves to share the many perks of working at Planit via #PlanitPerks. Submissions were evaluated by Advertising Age research partner Buck Consultants LLC. With nearly a century of experience in employee and human resources consulting, Buck crafted two surveys to help Advertising Age find the companies with the best benefits and most-engaged employees. The employer survey contained about 100 questions, including questions about pay, promotions, healthcare and other benefits and hiring practices. The employee survey contained about 50 questions. It measured aspects of the workplace environment that contribute to an engaged staff, including matters such as fairness of pay, vacation time, relationships with management and co-workers, career development and other workplace issues. Any agency, ad tech or media company with more than 40 full-time employees in the U.S. was eligible. Advertising Age is recognized as the leading global source of news, analysis and intelligence for the marketing and media community. Advertising Age includes ongoing coverage of strategic topics for marketers from mid to large companies complemented by breaking news and a database of the world’s best creative. The 84-year-old publisher produces more than 15 original rankings each year, including the 100 Leading National Advertisers and 100 Leading Media Companies lists, the Digital A-List and the annual Agency Report. BALTIMORE (November 12, 2014) — Planit, a Baltimore-based branding and marketing communications agency, today announces Rich Reiter has joined the firm as Creative Director. In his new role, Rich will oversee the agency’s entire creative operations ranging from branding, creative concept development and execution, to multimedia, interactive and mobile design. He will work across all clients, including national and international brands such as AGCO, DEWalt, Royal Building Products, Universal Music Group, Mally Beauty, Marriott International, and more. A native of Detroit, Rich joins Planit from Innocean in Chicago where he most notably led all brand and retail creative for Hyundai Motor Company. Prior to Innocean, Rich managed creative services for major brands such as McDonald’s, Coors, Walgreens, Yum Brands, Beefeater Gin, Wrigley’s, and Wilson Sports while working at Leo Burnett and Foote Cone Belding. Over the last decade Reiter’s work has been recognized by One Show, Print Magazine and by CAAA Chicago American Advertising Awards for Put the M Back in your Morning campaign for McDonald’s. A graduate of Michigan State University with (B.A. ), Communication and Media Studies, Rich also studied at the Portfolio Center in Atlanta with an emphasis on Art Direction. October 2008- Click here to read Planit president Matt Doud's take on the "shaky economy," as featured in The Daily Record. See what Planit’s co-founder Ed Callahan and media supervisor Kelly Brentzel have to say about digital and mobile advertising in this week’s issue of the Baltimore Business Journal. The article explores how advertisers are utilizing new methods to target their ideal customers. Also in this advertising-themed issue, Planit ranks No. 5 on the BBJ’s list of top advertisers in the city based on number of full-time employees. Planit is pleased to announce that it has secured a spot on the 2014 Inc. Magazine 5000 List of fastest-growing companies in the United States. Planit now holds the position of 3,145 on the esteemed list, up 17 spots from the previous year. “For 33 years, Inc has welcomed the fastest-growing private companies in America into a very exclusive club,” according to Eric Schurenberg, President and Editor in Chief of Inc. Magazine. 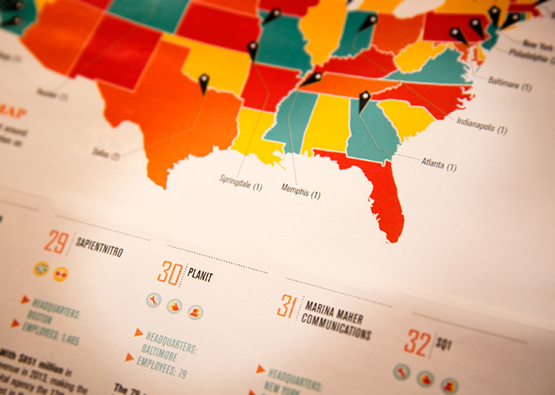 “The average company on the list grew a mind-boggling 516 percent. Those are results most businesses could only dream of.” Now in its eighth year, the Inc. 5000 is the most comprehensive portrait of America’s fastest-growing private companies assembled anywhere. The list is ranked according to percentage revenue growth when comparing 2010 to 2013. To make the cut, companies must have been founded and generating revenue by March 31, 2010, and have revenue no less than $2 million in 2013. Additionally, they had to be U.S.-based, privately held, and independent not subsidiaries or divisions of other companies as of December 31 of the last year measured. “Earning a spot on the Inc. 5000 list for the third year is an exceptional achievement,” said Matt Doud, president of Planit. “As we continue to move up in rank year after year, it’s validation that we’re doing something right—from fostering a culture of creativity and retaining top talent, to partnering with clients who share our bold business philosophy.” Planit, holding a position of 3,145 on the Inc. 5000, now shares a pedigree with Intuit, Zappos, Under Armour, Microsoft and dozens of other notable recent alumni to the Inc. 5000 list. Complete results of the Inc. 500/5000, including company profiles and an interactive database that can be sorted by industry, region, and other criteria, can be found at www.inc.com/5000. Planit today announces it has joined AMIN Worldwide as its Maryland partner. AMIN (Advertising Marketing International Network) is global alliance of more than 50 independently owned integrated advertising agencies, located across 29 countries with more than 3,100 professionals in the global network. “As we continue to build brands on a global scale, it’s time to bring greater emphasis toward growing our global footprint,” said Matt Doud, president of Planit. “Joining AMIN, a reputable network of likeminded independent agencies across the world, is one more proven way to strengthen our cultural insights, amplify our global resources and invest in the future of Planit.” Planit’s philosophy is grounded in consumer insight and results measurement. That philosophy is working for brands in myriad industries across the U.S. and beyond—from Royal Building Products, the leading exterior residential building products manufacturer in Canada, to AGCO, a global leader in agriculture based out of Duluth, Georgia. “We’re excited to add our unique expertise to a strong roster of national and global award-winning agencies, including other winners of the Ad Age Small Agency Awards,” said Ed Callahan, co-founder and creative strategist at Planit. “The collaborative relationships that exist among AMIN agencies are at the core of the success of our network, and we are thrilled to have Planit join as our Maryland agency,” said Susie Ketterer, AMIN Americas president. “We are impressed by their bold approach to branding, their diverse client roster, integrated offerings and resources for our members. Planit will certainly push us outside of our comfort zones here at the AMIN network, and we’re looking forward to it.” Clients of AMIN agencies represent some of the world’s leading brands in categories ranging from consumer packaged goods, healthcare, tech, professional services and a variety of business-to-business industry sectors. About AMIN AMIN, the Advertising and Marketing International Network, is a global alliance of independently owned advertising agencies. The alliance spans the globe, with member networks in the Americas, EMEA (Europe, Middle East and Africa) and Asia Pacific. Though independently owned and typically small to mid-sized, members are full-service agencies with specialized capabilities and annual gross incomes of more than $1 million. Visit http://www.aminworldwide.com/ for more information. About MAIF The Maryland Automobile Insurance Fund (MAIF) was created by the Maryland State Legislature in 1972. MAIF’s mission is to reduce the number of uninsured motorists in the state by providing automobile liability insurance for Maryland residents who are unable to obtain it elsewhere in the private insurance market. Baltimore firm recognized for PBS KIDS’ Writers Contest Website BALTIMORE (April 11, 2014) — Planit announced today that it has been recognized for its work with PBS KIDS’ Writers Contest website as an honoree for best website in the 18th Annual Webby Awards. Hailed as the “Internet’s highest honor” by The New York Times, The Webby Awards, presented by the International Academy of Digital Arts and Sciences (IADAS), is the leading international award honoring excellence on the Internet. The IADAS—which nominates and selects The Webby Award Winners—comprises web industry experts such as media mogul Arianna Huffington, Skype CEO Tony Bates, Mozilla CEO and Chair Mitchell Baker, Instagram co-founder Kevin Systrom, mobile phone inventor Martin Cooper and creator of the GIF, Steve Wilhite. 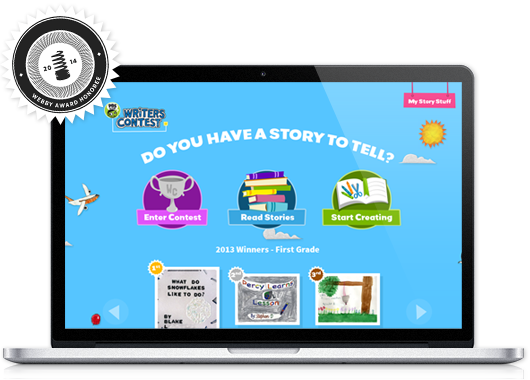 Each year kids across the country in kindergarten through third grade submit their own stories and illustrations through their local PBS stations that are then showcased on the Writers Contest website. PBS KIDS, in search of a partner to reimagine the website for the annual Writers Contest, looked to Planit as a firm that could transform the site experience into one that inspires creativity and captures the imaginative essence of the contest itself. Through innovative design solutions, the addition of an interactive Story Creations section and a series of hand-drawn illustrations for kids to incorporate into their storytelling, Planit created a way to keep kids engaged with the website year-round—even after the contest ended. “When PBS KIDS approached us to design the Writers Contest website, our team was thrilled at the opportunity to put our imaginations to work for kids across the country. And now to be named a Webby honoree for our site is an amazing distinction,” said Jess Brown, director of digital design at Planit. “Beyond the recognition, we hope this site serves as a springboard for teaching kids about community and purpose with their online interactions.” “Honorees like Planit are setting the standard for innovation and creativity on the Internet,” said David-Michel Davies, executive director of The Webby Awards. “It is an incredible achievement to be selected among the best from the 12,000 entries we received this year.” The 18th Annual Webby Awards received 12,000 entries from over 60 countries and all 50 states. Out of the 12,000 entries submitted, less than 15 percent were deemed honorees.About The Webby Awards Hailed as the “Internet’s highest honor” by The New York Times, The Webby Awards is the leading international award honoring excellence on the Internet, including Websites, Interactive Advertising & Media, Online Film & Video, Mobile & Apps, and Social. Established in 1996, The Webby Awards received nearly 12,000 entries from all 50 states and over 60 countries worldwide this year. The Webby Awards is presented by the International Academy of Digital Arts and Sciences (IADAS). Sponsors and Partners of The Webby Awards include: Microsoft, Dell, Vitamin T, MailChimp, Engine Yard, Funny or Die, AdAge, Percolate, Mashable, Business Insider, Internet Week New York and Guardian News and Media. BALTIMORE (March 21, 2014) — Last night a television network’s writers contest, an all-natural salad dressing and a global anti-poverty organization had two things in common: Their marketing was awarded the highest honors, and it was all done by Planit. Planit was the winning contestant in last night’s game show–themed awards event, hosted by the American Advertising Federation of Baltimore. The annual awards competition, also known as the American Advertising Federation Awards (formerly the ADDY® awards), celebrates Baltimore’s most talented marketing communications professionals. Highlights of the 18 awards won by Planit, by far the majority winner of the night, include BEST OF SHOW for Tessemae’s All Natural, BEST OF CATEGORY-PUBLIC SERVICE for the ONE Foundation’s annual report and SPECIAL JUDGES AWARD-DIGITAL for the PBS Kids Writers Contest website. Other awards the agency received were for work for clients including True Chesapeake Oyster Company, Under Armour, McCormick International, DEWALT, Sagamore Racing and WTMD. “As an agency, we have the luxury and the ability to test our clients’ comfort levels through edgy, creative and innovative campaigns. Our work that was recognized at the American Advertising Awards last night reflects just that,” said Matt Doud, president of Planit. “These awards are further proof to our clients and our industry that our method works, and we won’t ever stop pushing the needle.” This year, the American Advertising Federation of Baltimore received 242 entries from 34 different companies in the Baltimore area. To ensure fair judging, each entry was reviewed by four creative advertising professionals from outside of the Baltimore market. The 40th Annual American Advertising Federation of Baltimore awards event was held at the Hyatt Regency Baltimore on Thursday, March 20. This year’s theme was dedicated to the classic American game show, The Price Is Right, pitting more than 30 area agencies against each other to vie for the ultimate prize: BEST OF SHOW. To see photos from the event, click here. For more information on the American Advertising Federation of Baltimore and a complete list of last night’s winners, visit www.baltimoreadvertising.com.